It was larger, heavier, and more brick-like in its styling than its predecessor the T2. The T3 was manufactured in Germany from 1979 until 1990. Production of the 4WD (mostly for official use, like postal service or German army) continued until 1992 at Puch in Graz/Austria, where all 4WDs had been built. South African production of the T3 continued, for that market only, until 2002. The T3 was the final generation of rear-engined Volkswagens. Following the Type 2 T2, the Type 2 T3 initially featured air-cooled engines; later models had water-cooled engines. Versions produced in South Africa from 1990 until 2002 featured an Audi five-cylinder engine. Volkswagen marketed the Westfalia camper variant throughout the T3 production, with features including a raised roof (either pop-up or fixed), refrigerator, sink, and stove. Examples built between 1979 and 1985 featured round headlights and basic steel or chrome-plated steel bumpers with plastic end-caps. Air-cooled models (1979 to mid-1983) lack the lower grill above the radiator of the water-cooled models, except on models with factory air conditioning. 1986 model year vehicles received revisions including a tachometer, more fabric choices, redesigned air conditioner, larger water-cooled engine with a more advanced engine management system, and redesigned transmissions including an optional Syncro four-wheel drive. Exterior changes include rectangular headlights (on selected models) and different paint options. Alloy wheels, larger and squarer plastic bumpers with trim along the rocker panels were optional (standard on Hannover Edition vans). For 1990 and 1991 model years, a "Carat" trim level was available which included all available options except Westfalia conversion and 4WD. Some 1979, 1980, and 1981 models had eight welded-in metal slats covering the engine ventilation passages behind the rear windows. all later models had black plastic 16-slat covers that slotted in at the top and screwed down at the bottom. During the 1980s, the U.S. Army and Air Force in Germany used T3s as administrative (non-tactical) vehicles. In military use the vehicle's nomenclature was "Light Truck, Commercial". Porsche created a version called B32 in a limited edition. The van, based on the luxurious Carat model, was equipped with the 231 PS (170 kW) 3.2 liter Carrera engine and was originally developed to support Porsche's testing activities in Algeria. Ten of these were built, with some sold by Porsche to special customers. Porsche themselves also used the Porsche-engined bus to transport staff rapidly. Top speed was around 135 mph (217 km/h), although Porsche only claimed 116 mph (187 km/h) to ensure that the numbers could be replicated with nine people in the car and with the air conditioning on full. Oettinger developed a six-cylinder version called WBX6. 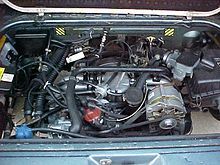 The engine is derived from the "Wasserboxer" engine and has many common parts with it. The development of the engine was originally contracted to Oettinger by VW. Oettinger bought the rights when VW decided not to use it. With the internal combustion engine and transaxle mounted very low in the back, the T3 had much larger disc brakes in the front, and drums in the rear. Axle weight is very nearly equal upon both the front and back ends of the vehicle. Unlike the T2 before it, the T3 was available with amenities such as power steering, air conditioning, power door locks, electrically controlled and heated mirrors, lighted vanity mirrors, and a light above the glove box (most of which were essentially standard equipment in later models). The automatic was a standard hydraulic three-speed unit, the same 090/010 unit as used in Audis of the era. These featured a cast aluminium alloy case for the transmission section, and a cast iron case for the final drive section. The 091 manual transmission was a four-speed unit, featuring a lightweight aluminium alloy case; from 1983 a 5-speed transmission was available as an option on certain models; a 5-speed was fitted as standard on Syncro four-wheel drive models. The oil filler tube for the engine is located behind the flip-down license plate door, as is the oil dipstick and the power steering fluid reservoir (when fitted). Most vans had a twist-on/off gas cap right on the outside just under and behind the passenger side door. A locking cap was optional. The spare tyre lies in a tray under the very front of the van (as the engine is in the back), just below the radiator. Because of the engine placement, a T3 has nearly equal 50/50 weight distribution fore and aft. The early air-cooled engines were somewhat expensive to produce and had some reliability problems. Volkswagen originally meant to replace them with the Golf's inline-four engine but the cost of re engineering both car and engine made them opt for updating the flat-four instead. An overhead-cam design was mooted but rejected as willingness to rev was considered to be of less importance than low-end flexibility and low cost. The new 1.9 "Wasserboxer" (for water-cooled boxer) was also originally considered for use in certain other Volkswagens such as the Gol, which still relied on the old air-cooled flat-four at that time. The U.S version 1.9 liter 1984 and the later 1985 and up water-cooled gasoline engines experienced significant and repeated problems with cylinder head surface erosion and coolant leaks. 2.1lr engines suffered the same, mostly due to not having the antifreeze changed often enough, and the use of phosphated coolant, which caused corrosion in the cooling system. There were four general petrol engine variants between 1979 and 1991, with several sub-models. All were overhead-valve push-rod horizontally opposed four-cylinder engines. Available engine options differed between regions. Aftermarket VW specialist Oettinger also offered the WBX6, a six-cylinder version. 2.1 L (2,109 cc) (95 bhp) (Serial # MV) Wasserboxer, used until the end of Vanagon importation into the US in 1991. This engine used a more advanced engine management system known as Bosch "Digifant" which now digitally managed ignition timing as well as fuel delivery. 2.1 L (2,109 cc) (112 bhp)(torque 128) (Serial # DJ) 10.3:1 compression ratio, Digijet injection, only sold in European countries not requiring catalytic converter. The Wasserboxer featured an aluminum case, cylinder heads, and pistons, and a forged steel crankshaft. The Wasserboxer, as with all VW boxer engines has a gear-driven camshaft. It also featured Heron, or "bowl-in-piston" type combustion chambers where the combustion takes place within the piston bowl area, and not just in the cylinder head as would be the case with flat top pistons.. The switch to water-cooled boxer engines was made mid-year in 1983. T2 transporters or 'bay window' vans, produced in Brazil until 2013, were switched to in-line 4-cylinder water-cooled engines and a front-mounted radiator in 2005. 3.7 L (3,664 cc) (180 bhp) VW-Oettinger Wasserboxer, fuel injected. In contrast to the standard flat-four gasoline engines, all diesel engine options were of an L4 inline configuration. 1.6 L (1,588 cc) (37 kW / 50 PS / 49 bhp) (Serial # CS) Naturally aspirated Diesel I4, available in the US on 1982/3 models only. 1.6 L (1,588 cc) (51 kW / 70 PS / 69 bhp) (Serial # JX) Turbocharged I4. 1.7 L (1,715 cc) (42 kW / 57 PS / 56 bhp) (Serial # KY) Natural aspirated I4. U.S. Vanagon model variations included the Vanagon, featuring vinyl seats and a spartan interior; the Vanagon L with optional cloth seats, more upscale interior panels, and an optional dashboard blower; the Vanagon GL with more equipment like a padded steering wheel and front armrests; and the Westfalia pop-top camper Vanagons, which came in two versions. A Camper version known as the "Campmobile" with integrated kitchen, complete with refrigerator (which ran on propane, 110 V or 12 V), a two burner stove, and stainless steel sink with onboard water supply. 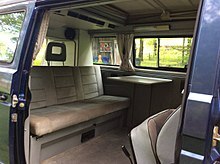 A fold down rear bench seat converted to a bed and the pop-top included a fold out bed; these models could sleep four adults. A 'Weekender ' version which lacked the refrigerator, propane stove, and sink of the full 'camper' versions offered an optional removable cabinet with a 12 volt cooler and self-contained sink. In 1984, the Wolfsburg edition was configured with a rear bench seat and two forward-facing middle seats. Under the bench seat, which folded down to make full size bed, was a storage compartment and a rear heater. Wolfsburg Edition "Weekender" models featured two rear-facing seats behind the front seats in place of a centre bench seat and a table that could fold up from the sidewall – or fold down when not in use. Multivan models featured Wolfsburg Edition trim and an interior with rear-facing seats, the same fold up table, a pop top with upper bed, and cabinet behind the rear seat on the driver's side. Wolfsburg Edition and camper van vehicles were outfitted for Volkswagen by the Westfalia factory. Syncro models were manufactured in limited numbers from 1985 through 1992, with the four-wheel drive system added by Steyr-Daimler-Puch Works in Graz, Austria, with a short wheelbase and 48/52 front/rear weight distribution. Model years 1980 through 1985 featured round sealed beam headlights. Subsequent models for North American and European markets featured round sealed beam headlights or smaller square headlights, with the primary lights outboard and high beams inboard. Later models from South Africa returned to round headlight housings for both the primary headlights and high-beams. This is known to VW enthusiasts as the "South African look," and swapping the square headlights to round headlights is a popular conversion by van owners with non-South African vehicles. 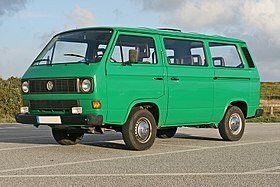 The T3 was replaced by the T4 (Eurovan) in the U.S. market in 1993 (1992 saw no Volkswagen bus imported to the U.S. market, aside from custom campers sold by companies other than Volkswagen). Top-of-the-line Wolfsburg Edition Westfalia Campers, which had all options, were at the top of the price range. In addition to the camper models, a Carat trim level was available for 1990 and 1991 model years. This model included all options available for the Transporter configuration. Some models featured optional aluminum alloy wheels. Production of the T3 continued in South Africa until June 2002, when, due to the economies of scale, Volkswagen SA were obliged to discontinue production after parts supply started to become an issue. The South African T3s post 1991 had a face-lift which included modified front door sheet metal, bigger side windows behind the B pillars and different rear grilles in the D pillars. The bodyshell is a true RHD design lacking the unused door track cover on the offside and LHD wiper arm mount points as found on earlier models (which were originally designed as an adaptation of a LHD Twin-sliding door bodyshell). On models with 5-cylinder engines the boot floor was raised to accommodate the taller engine and has small storage areas either side of the engine hatch. Internal changes include a fully padded dashboard featuring a smaller glove box and updated vacuum-powered ventilation controls operated by round knobs rather than slide levers, the fuse box was also relocated to the right hand side of the steering column. At the front of the vehicle twin-headlamps in both round and rectangular configurations were fitted along with a full width lower grille incorporating the indicator lenses, which were changed from amber to smoked lenses from 1999 onwards, this grille and headlight combination was not found anywhere else in the world. These later South African T3s became known as Big Window T3s due to their larger side windows. In January 1991 the 2.1 Wasserboxer engines were replaced with five-cylinder Audi engines in the "Microbus" and "Caravelle", while a VW 1.8 inline-four cylinder engine was used in the "Kombi" and "Van" models. A 2.1 Wasserboxer Syncro Big Window model was also added, in Microbus or Caravelle trim. 89 such cars were assembled until 1992 when the model was discontinued. The five-cylinder T3's came out initially with a 2.5 litre fuel-injected engine in 1991, but this was replaced in March 1995 with a 2.6 litre with an improved fuel injection system and two styles of 15" alloy wheels as standard (Rhein or Starburst) along with larger ventilated front disc brakes. The automatic option for the 2.5 was dropped, leaving only the five-speed manual. A slightly lower spec 2.3 five cylinder fuel-injected model was introduced four months after the 2.6 but was equipped with a 4-speed transmission and modified wrap-around steel bumpers. Near the end of production, a top of the range Caravelle 2.6i known as the "Exclusiv" incorporated two rear-facing seats in place of the centre bench seat, a fridge and a folding table in the back of the vehicle and Carat 2 alloy wheels. A Microbus 2.6i with similar features, but with Rhein alloy wheels was known as the "Activ". The last T3 off the production line in Uitenhage on Friday June 16, 2002 was a gold-coloured Microbus 2.6i which Volkswagen SA retained for their AutoPavilion, Place of Cars and Legends, which first opened its doors in 2004. The vehicle was later written off in a transporter roll-over accident in November 2006, after returning from a display in Cape Town. Approximately 45 WBX6 engines were imported to South Africa. 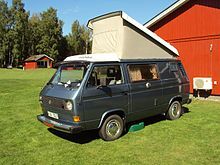 The T3 has a large cult following, especially the Westfailia camper version, and many owners have had the VW engines replaced, due to their reputation of being underpowered and unreliable, particularly the Wasserboxer. Subaru engines are one of the most popular engines to install to increase power and reliability, as their overhead camshaft four cylinder boxer engines are very similar in size and configuration to the original VW pushrod engines. Other conversions have included Porsche 911 engines, VW Rabbit diesel engines, Golf/Jetta petrol engines and Ford Zetec engines. Five-cylinder Audi engines were used in South Africa on higher-trim vans after the Wasserboxer engine was discontinued in 1991, until the T3 was discontinued in 2002. ^ "Goodbye 'Gus'". Car Magazine (South Africa). Ramsay Media. Retrieved 24 February 2011. ^ a b Kacher, Georg (September 1984). Cropley, Steve (ed.). "Autobahn activist". Car. London, UK: FF Publishing: 99–100. ^ a b Kacher, Georg (May 1982). "Intertruck: Germany". TRUCK. London, UK: FF Publishing Ltd: 31. ^ "Pics: VWSA museum cars destroyed in wreck". 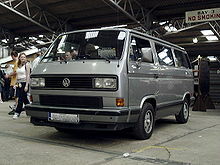 Wikimedia Commons has media related to Volkswagen T3.